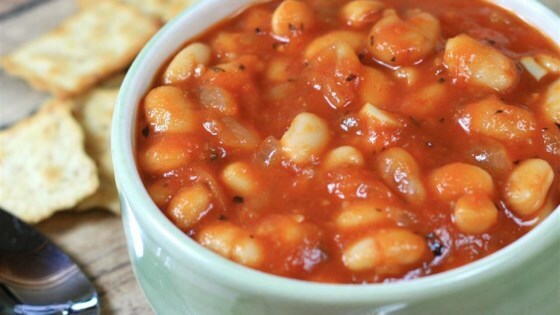 "Simple and basic Italian bean soup. Great for a quick fix during the week. My Italian mother-in-law rattled this one out to me over the phone years ago. So glad I wrote it down quick! She doesn't remember telling me. The kids love it for a simple and quick dinner." Heat olive oil in a pot over medium-high heat. Cook and stir onion in hot oil until tender, about 5 minutes; add garlic and continue cooking until fragrant, 1 to 2 minutes more. Pour tomato sauce into the pot; stir. Add cannelini beans, basil, oregano, salt, and pepper. Bring the mixture to a simmer, reduce heat to medium-low, and cook until the beans are hot, 5 to 7 minutes more. You can add orzo, cut spaghetti, or grated cheese. It's also good with just some saltine crackers. Garbanzo beans work just as well as cannellini in this recipe. My husband liked it, so all was not lost, but this "soup", which is more like a tomato-based bean stew (and a plain one at that) called for entirely too much onion, and was just boring to me. Simply quick and delicious ! Delicious and quick healthy meal.. Very simple and would cost so much more if you purchased it and it took a total of 30 minutes to make. Great soup for a quick meal. I added grated Parmesan and Romano cheese and it was a really good complement to the tomato flavor.